Make Brushing Teeth More Fun! Learn About Brushing Teeth – Kids might be more enthusiastic about brushing their teeth if they understand WHY it’s important. Try this fun egg toothbrushing experiment from Life with Moore Babies. Dance to the MUSIC – Play some music on and dance while you brush! Try an ARM & HAMMER™ Tooth Tunes™ Toothbrush! If you’re not up for singing like Katie, try the new ARM & HAMMER™ Tooth Tunes™ Toothbrush that plays hit music from popular One Direction. We were sent an ARM & HAMMER™ Tooth Tunes™ toothbrush to try and I was actually pleasantly surprised by how much the kids love it. While they are a bit young to know specific musicians, they recognized the One Direction song, “What Makes You Beautiful,” that it played right away from hearing it on the radio. ARM & HAMMER Tooth Tunes featuring One Direction is the only toothbrushes that plays One Direction in North America. The toothbrush has this fancy-pantsy technology that plays music right through the vibrations in the child’s mouth and plays for exactly 2 minutes to encourage suggested brushing time. Two minutes is a long time to my little ones. But Priscilla danced right along to the music and brushed away for the entire time! And Sawyer enjoyed her toothbrush’s music just as much while he used his old standard brush. You can find the ARM & HAMMER™ Tooth Tunes™ Toothbrush at major retailers nationwide for the suggested retail price of $9.99. Well worth it to make brushing teeth more fun for the kids and easier on mom, too! Learn more about the clever toothbrush options by following ARM & HAMMER’s on Facebook. How do you make brushing teeth more fun for your kids? Any tips or tricks to get them brushing longer and better? I love to link up with: Thrift Share Monday, Contest Corner, Made by Me Monday, Just Something I Whipped Up, Made by Little Hands Monday, Tasty Tuesdays, Frugal & Fabulous Giveaways, Tuesday Tots, Tip Me Tuesday, Get Your Craft on Tuesday, Made by Me Wednesday, Sugar & Spice Wednesday, Kids Get Crafty Wednesday, The Mommy Club Wednesdays, It’s Playtime Thursday, Thursday Giveaway Linky, What Are Little Boys Made of Thursday, The Weekly Kids Co-op, Read Explore Learn Friday, For the Kids Friday, Kitchen Fun and Craft Friday, Bonggamom’s Friday Finds, Delicately Constructed Fridays, Freebie Friday, Pin It Friday, Show & Share Saturday, Share it Saturday, Super Saturday Giveaway Link-up, The Sunday Showcase, The Sunday Parenting Party, Around the Blogosphere, Afterschool Express, and Link & Learn Sunday. Disclaimer: I am part of the Mom It Forward blogger network. 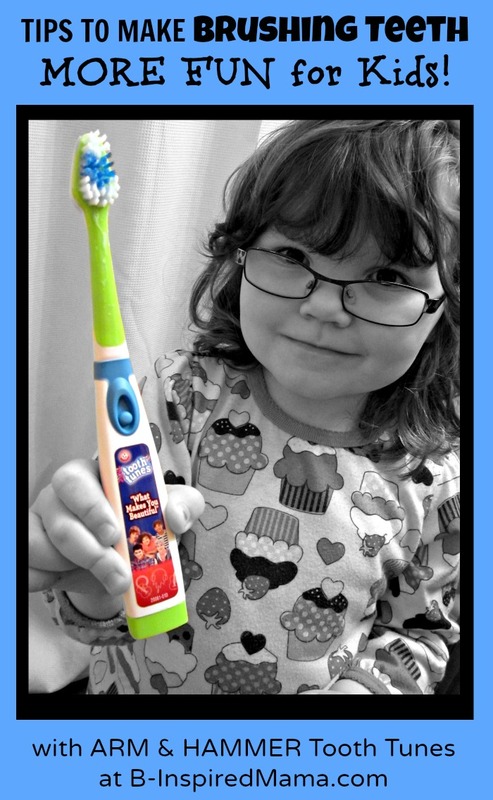 Mom It Forward and ARM & HAMMER™ Tooth Tunes™ partnered in support of this campaign. ARM & HAMMER™ Tooth Tunes™ compensated me for participation in this campaign. However, all thoughts and opinions are my own. Please see my disclosure policy. You have some good tips for making kids enjoy brushing their teeth more. I have a young son, and he isn’t exactly a fan of brushing. I am not much of a singer, but I still think my son might like it if I try singing to him. Thanks for the tip! I think it’s important to let your kids see YOU brush your teeth and show them that we all need to do it. Most days, that means I brush an extra time but I think it’s worth it. I sing and stop whenever E pulls out the toothbrush or tries to close her mouth.